A suburb is a mixed-use or residential area, existing either as part of a city or urban area or as a separate residential community within commuting distance of a city. 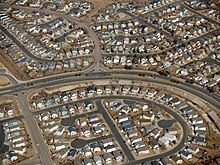 In most English-speaking countries, suburban areas are defined in contrast to central or inner-city areas, but in Australian English and South African English, suburb has become largely synonymous with what is called a " neighborhood" in other countries and the term extends to inner-city areas. In some areas, such as Australia, India, China, New Zealand, the United Kingdom, and a few U.S. states, new suburbs are routinely annexed by adjacent cities. 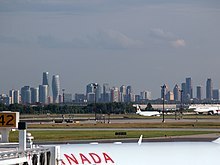 In others, such as Saudi Arabia, Canada, France, and much of the United States, many suburbs remain separate municipalities or are governed as part of a larger local government area such as a county. In the United Kingdom and in Ireland, suburb merely refers to a residential area outside the city centre, regardless of administrative boundaries. Suburbs, in this sense, can range from areas that seem more like residential areas of a city proper to areas separated by open countryside from the city centre. In large cities such as London and Leeds, suburbs include formerly separate towns and villages that have been gradually absorbed during a city's growth and expansion, such as Ealing, Bromley, and Guiseley. By the mid-19th century, the first major suburban areas were springing up around London as the city (then the largest in the world) became more overcrowded and unsanitary. A major catalyst for suburban growth was the opening of the Metropolitan Railway in the 1860s. The line joined the capital's financial heart in the City to what were to become the suburbs of Middlesex. Harrow was reached in 1880. Unlike other railway companies, which were required to dispose of surplus land, the Met was allowed to retain such land that it believed was necessary for future railway use. [note 1] Initially, the surplus land was managed by the Land Committee,  and, from the 1880s, the land was developed and sold to domestic buyers in places like Willesden Park Estate, Cecil Park, near Pinner and at Wembley Park. The Committee's report of 1917 was taken up by the government, which passed the Housing, Town Planning, &c. Act 1919, also known as the Addison Act after Dr. Christopher Addison, the then Minister for Housing. The Act allowed for the building of large new housing estates in the suburbs after the First World War,  and marked the start of a long 20th century tradition of state-owned housing, which would later evolve into council estates. The Report also legislated on the required, minimum standards necessary for further suburban construction; this included regulation on the maximum housing density and their arrangement and it even made recommendations on the ideal number of bedrooms and other rooms per house. Although the semi-detached house was first designed by the Shaws (a father and son architectural partnership) in the 19th century, it was during the suburban housing boom of the interwar period that the design first proliferated as a suburban icon, being preferred by middle class home owners to the smaller terraced houses. 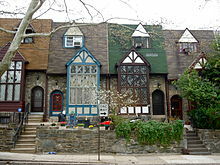 The design of many of these houses, highly characteristic of the era, was heavily influenced by the Art Deco movement, taking influence from Tudor Revival, chalet style, and even ship design. At the same time, African Americans were rapidly moving north for better jobs and educational opportunities than were available to them in the segregated South. Their arrival in Northern cities en masse, in addition to being followed by race riots in several large cities such as Detroit, Chicago, Washington, D.C., and Philadelphia, further stimulated white suburban migration. The growth of the suburbs was facilitated by the development of zoning laws, redlining and numerous innovations in transport. After World War II availability of FHA loans stimulated a housing boom in American suburbs. In the older cities of the northeast U.S., streetcar suburbs originally developed along train or trolley lines that could shuttle workers into and out of city centers where the jobs were located. This practice gave rise to the term " bedroom community", meaning that most daytime business activity took place in the city, with the working population leaving the city at night for the purpose of going home to sleep. Zoning laws also contributed to the location of residential areas outside of the city center by creating wide areas or "zones" where only residential buildings were permitted. These suburban residences are built on larger lots of land than in the central city. For example, the lot size for a residence in Chicago is usually 125 feet (38 m) deep,  while the width can vary from 14 feet (4.3 m) wide for a row house to 45 feet (14 m) wide for a large stand–alone house. [ citation needed] In the suburbs, where stand–alone houses are the rule, lots may be 85 feet (26 m) wide by 115 feet (35 m) deep, as in the Chicago suburb of Naperville. [ citation needed] Manufacturing and commercial buildings were segregated in other areas of the city. In the U.S., 1950 was the first year that more people lived in suburbs than elsewhere. In the U.S, the development of the skyscraper and the sharp inflation of downtown real estate prices also led to downtowns being more fully dedicated to businesses, thus pushing residents outside the city center. In the 20th century, many suburban areas, especially those not within the political boundaries of the city containing the central business area, began to see independence from the central city as an asset. In some cases, suburbanites saw self-government as a means to keep out people who could not afford the added suburban property maintenance costs not needed in city living. Federal subsidies for suburban development accelerated this process as did the practice of redlining by banks and other lending institutions. In some cities such as Miami and San Francisco, the main city is much smaller than the surrounding suburban areas, leaving the city proper with a small portion of the metro area's population and land area. Cleveland, Ohio is typical of many American central cities; its municipal borders have changed little since 1922, even though the Cleveland urbanized area has grown many times over. [ citation needed] Several layers of suburban municipalities now surround cities like Boston, Cleveland, Chicago, Detroit, Los Angeles, Dallas, Denver, Houston, New York City, San Francisco, Sacramento, Atlanta, Miami, Milwaukee, Pittsburgh, Philadelphia, Phoenix, Roanoke, St. Louis, Salt Lake City, Las Vegas, Minneapolis, and Washington, D.C..
Lower densities than central cities, dominated by single-family homes on small plots of land – anywhere from 0.1 acres  and up – surrounded at close quarters by very similar dwellings. Subdivisions carved from previously rural land into multiple-home developments built by a single real estate company. These subdivisions are often segregated by minute differences in home value, creating entire communities where family incomes and demographics are almost completely homogeneous. [ citation needed]. A greater percentage of one- story administrative buildings than in urban areas. Often, Canadian suburbs are less automobile-centred and public transit use is encouraged but can be notably unused. Throughout Canada, there are comprehensive plans in place to curb sprawl. Population and income growth in Canadian suburbs had tended to outpace growth in core urban or rural areas, but in many areas this trend has now reversed. The suburban population increased 87% between 1981 and 2001, well ahead of urban growth. The majority of recent population growth in Canada's three largest metropolitan areas ( Greater Toronto, Greater Montréal, and Greater Vancouver) has occurred in non-core municipalities. This trend is also beginning to take effect in Vancouver, and to a lesser extent, Montréal. In certain cities, particularly Edmonton and Calgary, suburban growth takes place within the city boundaries as opposed to in bedroom communities. This is due to annexation and large geographic footprint within the city borders. The growth in the use of trains, and later automobiles and highways, increased the ease with which workers could have a job in the city while commuting in from the suburbs. In the United Kingdom, as mentioned above, railways stimulated the first mass exodus to the suburbs. The Metropolitan Railway, for example, was active in building and promoting its own housing estates in the north-west of London, consisting mostly of detached houses on large plots, which it then marketed as " Metro-land". The Australian and New Zealand usage came about as outer areas were quickly surrounded in fast-growing cities, but retained the appellation suburb; the term was eventually applied to the original core as well. 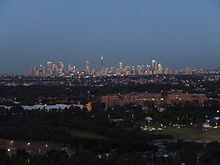 In Australia, Sydney's urban sprawl has occurred predominantly in the Western Suburbs. The locality of Olympic Park was designated an official suburb in 2009. In China, the term suburb is new, although suburbs are already being constructed rapidly. Chinese suburbs mostly consist of rows upon rows of apartment blocks and condos that end abruptly into the countryside. Also new town developments are extremely common. Single family suburban homes tend to be similar to their Western equivalents; although primarily outside Beijing and Shanghai, also mimic Spanish and Italian architecture. In Hong Kong, however, suburbs are mostly government-planned new towns containing numerous public housing estates. New Towns such as Tin Shui Wai may gain notoriety as a slum. However, other new towns also contain private housing estates and low density developments for the upper classes. Suburbs typically have longer travel times to work than traditional neighborhoods. Only the traffic within the short streets themselves is less. This is due to three factors:[ citation needed] almost-mandatory automobile ownership due to poor suburban bus systems, longer travel distances and the hierarchy system, which is less efficient at distributing traffic than the traditional grid of streets. In the suburban system, most trips from one component to another component requires that cars enter a collector road[ citation needed], no matter how short or long the distance is. This is compounded by the hierarchy of streets, where entire neighborhoods and subdivisions are dependent on one or two collector roads. Because all traffic is forced onto these roads, they are often heavy with traffic all day. If a traffic crash occurs on a collector road, or if road construction inhibits the flow, then the entire road system may be rendered useless until the blockage is cleared. The traditional "grown" grid, in turn, allows for a larger number of choices and alternate routes. Suburban systems of the sprawl type are also quite inefficient for cyclists or pedestrians, as the direct route is usually not available for them either[ citation needed]. This encourages car trips even for distances as low as several hundreds of yards or meters (which may have become up to several miles or kilometers due to the road network). Improved sprawl systems, though retaining the car detours, possess cycle paths and footpaths connecting across the arms of the sprawl system, allowing a more direct route while still keeping the cars out of the residential and side streets. 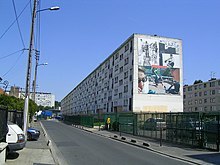 French songs like La Zone by Fréhel (1933), Aux quatre coins de la banlieue by Damia (1936), Ma banlieue by Reda Caire (1937), or Banlieue by Robert Lamoureux (1953), evoke the suburbs of Paris explicitly since the 1930s. Those singers give a sunny festive, almost bucolic, image of the suburbs, yet still few urbanized. During the fifties and the sixties, French singer-songwriter Léo Ferré evokes in his songs popular and proletarian suburbs of Paris, to oppose them to the city, considered by comparison as a bourgeois and conservative place. The American photojournalist Bill Owens documented the culture of suburbia in the 1970s, most notably in his book Suburbia. The 1962 song " Little Boxes" by Malvina Reynolds lampoons the development of suburbia and its perceived bourgeois and conformist values,  while the 1982 song Subdivisions by the Canadian band Rush also discusses suburbia, as does Rocking the Suburbs by Ben Folds. The 2010 album The Suburbs by the Canadian-based alternative band Arcade Fire dealt with aspects of growing up in suburbia, suggesting aimlessness, apathy and endless rushing are ingrained into the suburban culture and mentality. Suburb The Musical, was written by Robert S. Cohen and David Javerbaum. Over the Hedge is a syndicated comic strip written and drawn by Michael Fry and T. Lewis. It tells the story of a raccoon, turtle, a squirrel, and their friends who come to terms with their woodlands being taken over by suburbia, trying to survive the increasing flow of humanity and technology while becoming enticed by it at the same time. A film adaptation of Over the Hedge was produced in 2006. British television series such as The Good Life, Butterflies and The Fall and Rise of Reginald Perrin have depicted suburbia as well-manicured but relentlessly boring, and its residents as either overly conforming or prone to going stir crazy. In contrast, U.S. shows – such as Knots Landing, Desperate Housewives and Weeds – portray the suburbs as concealing darker secrets behind a façade of perfectly manicured lawns, friendly people, and beautifully kept houses. Films such as The 'Burbs, Disturbia and Hot Fuzz, have brought this theme to the cinema. This trope was also used in the episode of The X-Files " Arcadia" and on one level of the video game Psychonauts. ^ Clapson, Mark (2000). "The suburban aspiration in England since 1919". Contemporary British History. 14: 151–174. doi: 10.1080/13619460008581576. ^ Lofthouse, Pamela (2012). "The Development of English Semi-detached Dwellings During the Nineteenth Century". Papers from the Institute of Archaeology. 22: 83–98. doi: 10.5334/pia.404. ^ Ward David (1964). "A Comparative Historical Geography of Streetcar Suburbs in Boston, Massachusetts and Leeds, England: 1850–1920". Annals of the Association of American Geographers. 54 (4): 477–489. doi: 10.1111/j.1467-8306.1964.tb01779.x. ^ Yen, Hope. " White flight? Suburbs lose young whites to cities." Associated Press at Yahoo! News. Sunday May 9, 2010. Retrieved on May 10, 2010. ^ Ruth McManus, and Philip J. Ethington (2007). "Suburbs in transition: new approaches to suburban history". Urban History. 34 (2): 317–337. doi: 10.1017/S096392680700466X. ^ Mary Corbin Sies (2001). "North American Suburbs, 1880–1950". Journal of Urban History. 27 (3): 313–46. doi: 10.1177/009614420102700304.